Last week I hosted a Back to School Crafts program for our middle schoolers and a good time was had by all. First of all, I have to give props to The YA YA YAs because I totally got these ideas from them. 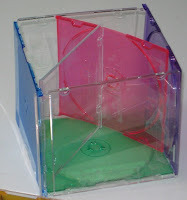 We started by making pencil holders out of CD jewel cases. I was supremely lucky in that one of our tech guys happened to have a whole HUGE box of jewel cases that he was looking to get rid of. Instructions for the craft are on Craft Chi. I made a couple on my own before I started and I've got a couple of recommendations. When taping the bottom piece and the inside dividers, I found it easier to put strips of tape on first and then place the pieces where I wanted them and fold the tape over to tape in place. So, say for the bottom piece, I flipped it over and put tape on each side. Then I placed it on the square piece and folded the tape over (as opposed to holding it in place and putting each piece of tape on). Also, (maybe this is common sense) I found it much easier to cut strips of tape in advance rather than putting one piece on and holding it in place while I tried to cut more tape. 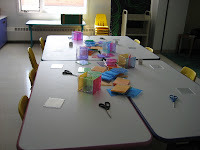 The kids completed this craft in about 20 minutes and what I liked best was that everyone's was different (different colors, different placement of the dividers, etc.). When everyone was finished with their pencil holder, we moved on to creating locker magnets. These are super easy, super fun, and look super cool. I bought flat craft marbles at Hobby Lobby (after looking ALL OVER the store for them, I found them with the floral/wedding stuff). You can use any old magazines you want... we actually used a bunch of our old Midwest Tapes catalogs because they had tiny pictures of DVD covers that turned out really well. Just lay the marble down on the paper and trace around it. 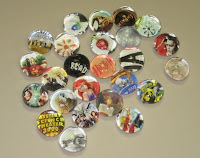 Cut out the picture and glue it to the flat side of the marble so that you can see the picture through the rounded side. It's much easier to put the glue on the marble than to put it on the paper. Then glue a magnet on the back. The kids had a blast making magnets and they didn't want to stop. (We totally could have done that for the whole 45 minutes and they would have been fine with that.) I let them take some of the leftover supplies home and emphasized that they could get all this stuff at any craft store for cheap and the magnets would make great gifts! Yay for a fun, CHEAP, easy craft program! So many times I have envied those little glass marble magnets... It is high time I made some! Did you use any special kind of glue, or just Elmer's? We just used Elmer's and it worked fine! I like what you said about enjoying the way kids all did their pencil holders differently. It's one of the things I love about doing crafts with my middle schoolers and high schoolers, the way they are so creative. You give them the materials, and they amaze you with what they do with them, and all in their own style. Wow wonderful ideas!! The jewel box, did you wrap a paper over the cd it would look pretty good!